The new innovative, revitalizing shower gel helps reveal beautiful, glowing skin with rich moisturizers and the antioxidant power of Vitamin C to help nourish your skin. Available in four luscious fruit filled scents (Citrus Splash, Very Berry, Peach & Mango and Pomegranate Acai), Zest Fruitboost stimulates your senses at a whole new level. It’s also twice as concentrated as the average shower gel providing double the lather and double the scent, and can be used to up to 40 showers making it a great value. This is the perfect stocking stuffer for any tween in your house! These were priced at $2.98 at my local Walmart, so only $1.98 each after coupon! 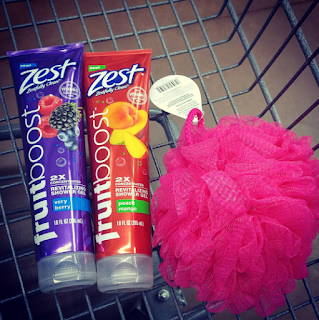 Pair with some fun shower sponges for a great stocking stuffer. New Fruitboost™ Shower Gels are perfect for any one in your house! My tween loves them! She is active in soccer and between games and practices, it seems like she is in the shower all the time. 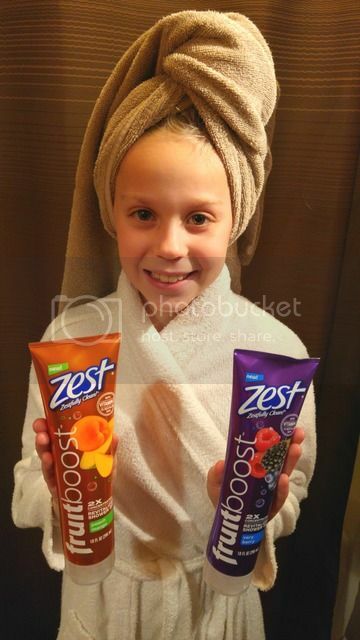 I highly doubt now her shower time is going to go down any, not with these luscious fruit scents. These shower gels moisturize nourish the skin with Vitamin C.
They help to invigorate you and boost you in the morning to get your day started! The boast 2X concentrated for more lather, more fragrance, and they aren't wrong. There is so much scent and lather packed into that bottle. Not only do you smell great, but your bathroom smells wonderful afterwards too! Fruitboost™ Citrus Splash scent - The ultimate Citrus fragrance experience. A citrus sparkle with a touch of key lime to boost the power of your shower with an escape to the tropics, leaving you… Fresh. Fruity. Zestfully Clean™! Fruitboost™ Peach Mango scent - Revitalizing Shower Gel. A deliciously sweet scent. An exotic burst of white peach and champagne mango to boost the power of your shower with this wonderfully juicy scent. Fruitboost™ Very Berry scent - This Revitalizing Shower Gel features a smooth burst of succulent berries combine in this luscious berry filled scent that nourishes your skin leaving you fresh and fruity!